Montegrazie is a nice little town with the beautiful church of Nostra Signora delle Grazie. Whoever spends his holiday home vacation in Montegrazie should by no means miss three things: these are the Nosta Signora delle Grazie Church , the restaurant Al Santuario and the wonderful hiking trails through the wonderful olive groves. From there you will time and again get a fantastic view of the surrounding villages. These hiking trails will also lead you to the Pilgrimage Church of Nosta Signora delle Grazie. Not only has the ambience here excited every visitor. The main reason for visiting Roberto and his family in the Al Santuario restaurant is above all because of the Ligurian delicacies. This rural restaurant offers a special type of menu of the. You will not be given a menu card, but rather several starters and main courses, such that by the end of the evening you will have sampled many different types of Ligurian specialities. Montegrazie is a small medieval village, which lies in the hinterland of Imperia. From here one can reach the gravel beaches of Imperia Porto Maurizio in less than 15 minutes. 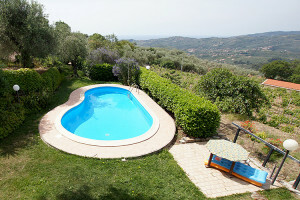 The place in itself offers wonderful lanes, which are attractive for walks and now and again give you wonderful views. The church of Nostra Signora delle Grazie is most especially worth seeing. It dates back to 1450 and from its Piazza one has a wonderful view of the village and the surroundings. It is said, that the church was constructed by a father of a deaf and dumb girl from Moltedo. The girl prayed to the Virgin Mary while tending her herds in this place and she implored her to give her a voice. She wanted to praise the wonderful gifts of this world and the ruler of heaven. When she looked up, she saw a glimmering dazzling light. In it the Holy virgin could be seen with the child Jesus in her arms. He said to her, the girl should go to her father and request him to build a church up here for the Holy Virgin Mary. The father believed her straight away, when the girl told him of the vision. His child got healed from deafness and dumbness and in appreciation he built a chapel up here on the hill. Later, with the help of sponsors the present church was built and was consecrated on 21st March 1450. The stone on which the Virgin Mary sat, when she appeared to the small girl, was integrated into the first altar, which is dedicated to the Virgin Mary. 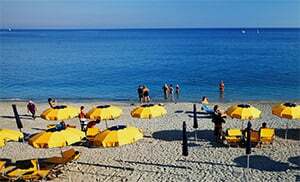 Montegrazie belongs to the municipality of Imperia and is a village in Imperia province which lies in the Liguria region. Near Montegrazie are several other villages like: Moltedo (6.4 km), Caramagna Ligure (3.7 km) and Dolcedo (9 km). From Genoa take the Imperia Ovest highway exit and follow the Via Tommaso Littardi towards SP41. Join Via Moltedo and later Montegrazie Street, then Str. della Ciappa towards Via delle Scuole in Montegrazie.